Ethan is a Native of St. Petersburg, Florida. After graduating from Asbury with a BA in Social Work in 2013 He and is wife, Jordan, moved to Phoenix, AZ to complete an MSW from Arizona State University. He has a strong passion for working with adult mental health and has experience with in-home counseling, medical social work, and school based mental health services. In 2016, Ethan moved back to Wilmore to take on the Resident Director role in Trustees hall. Ethan began Adjunct teaching in the Fall of 2017. 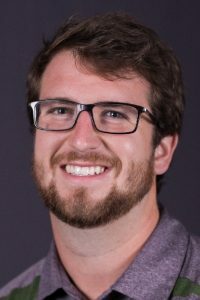 Ethan has a strong passion for Christian Higher Education and desires to challenge students to think outside of the box in order to better their ability in the social work field. When Ethan is not in the classroom, he enjoys spending time with Jordan and their two sons, Jonah and Silas. He enjoys being outdoors, spending time with his friends and family.